25' Eliminator power vessel | Christian & Co. The vessel was inspected while on its trailer. Hull construction material is molded fiberglass. Deck is constructed of molded fiberglass and above deck structures are constructed of molded fiberglass. Coring is unknown. Bulkheads are constructed of molded fiberglass with unknown core. Overall condition of the hull structure appears good. The vessel’s weight is 4000 LBS (approximate). Exterior rails and hardware appear good. Cosmetic condition of vessel appears good externally and good internally. Vessel’s external colors are white and red topsides, red/blue/gray checkered graphics. Below waterline through hull fittings appear none. The vessel is equipped with one electric bilge pump that appears satisfactory and the bilge is clean and dry. The ventilation system consists of one blower and natural ventilation and appears satisfactory. General housekeeping appears good. The condition of the coring, in the stringers, deck, and elsewhere as applicable, is beyond the scope of this inspection. Engine external surfaces appear good and exhibit no leaks. Engine hour meters exhibit 244 hours. Motor mounts appear good. Cooling systems appear good. Fuel system and components appear good. Exhaust systems and components appear good. Electrical system and components appear good. Engine control system appears good and outdrive appears good. Steering control system appears good. Propulsion components appear good. There is 70 gallon capacity in two tanks located outboard port and starboard. Fuel tank surfaces were not accessible and the securing mechanism was not seen. The fuel fill, vent and feed components were not visible. Fuel fill to tank bonding were not visible. Fuel shut off valves are located aft of engine to starboard and appear satisfactory. There is no AC system aboard. Battery arrangement appears satisfactory. Batteries are equipped with a disconnect switch. DC wiring appears good. Circuit protection for the DC branch system appears satisfactory. Wire terminations and connections appear good. Wire organization and arrangement appears good. Vessel has one portable fire extinguisher with expired certification. Vessel has no fixed fire suppression system. The safety components include: five type II PFDs, four type III and one throwable PFD; no distress flares were seen aboard; two anchors with suitable chain and line and appears satisfactory. Navigational and anchor lights appear properly arranged, installed and functional. The vessel was inspected at its normal slip location. The vessel is currently stored in the client’s residence garage. The vessel is a production built fiberglass high performance tunnel hull power vessel equipped with a gasoline inboard outboard engine. 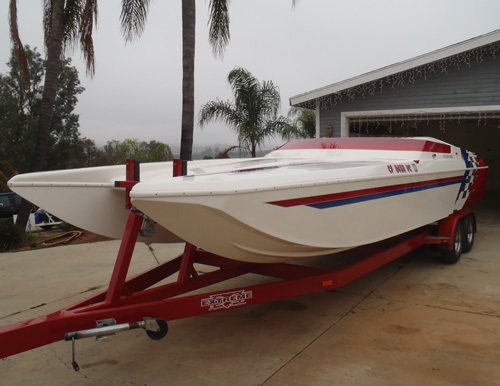 The vessel was built in 1999 (2000 model year) by Eliminator Boats in Mira Loma, California. The vessel was inspected while on it trailer. The vessel was not test operated or sea trialed during this inspection. The vessel is in as built structural condition and in good cosmetic and mechanical condition. The vessel is suitable for its intended use a protected water sport power boat. 1. The vessel has no firefighting equipment. Provide adequate current firefighting equipment as recommended by the NFPA and required by federal regulations. 2. No visual distress signal flares were seen on the vessel. Provide current distress signal flares as required by federal regulations. 1. The trailer was visually inspected only. Please consult with a qualified trailer technician as to the mechanical condition of the trailer and related components.